China has successfully developed the technology that enables the use of hydrogen to fuel rail vehicles, as it presented on March 19, Thursday, the world's first hydrogen-powered tramcar at an assembly facility in Qingdao. Liang Jianying, chief engineer of Sifang Co., a subsidiary of China South Rail Corporation (CSR), told Xinhua that China is the only country in the world that has fully developed the technology for rail system and the new tram is the only one of its kind in the field. "It took two years for Sifang to solve key technological problems, with the help of research institutions," Liang was quoted as saying. Hydrogen fuel cells are considered as a new source of clean energy, which are popularly used in automobiles but rarely applied in rail transportation, the report said. The report added that refilling the tram with hydrogen only takes about three minutes, but it can run the distance of 100 kilometers at the maximum speed of 70 kilometers per hour. "The average distance of tramcar lines in China is about 15 km, which means one refill for our tram is enough for three round trips," Liang added. The chief engineer said that they are studying ways on how to further reduce the overall running costs of the tram, but also highlighted the advantages of the hydrogen-powered tram as a safe and environment-friendly form of transportation. 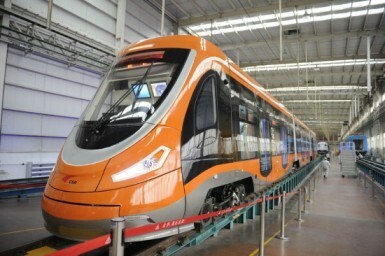 Liang made an assurance that the new tram will not produce nitrogen oxides since the temperature of the reaction inside the fuel cell will be placed under control at 100 degrees Celsius. He added that the tram will only emit water. The report said that each tram has over 60 seats that can carry at least 380 passengers.